Which Pocket Knife for Older Hands? ToolGuyd > Hand Tools > EDC, Pocket, & Multitools > Which Pocket Knife for Older Hands? Paul wrote in with a tough question, asking about knives that are easier to open and close for persons with older or arthritic hands. Hey Stuart, I’ve also asked Anthony, but I thought I’d check with you too. I’m looking to get a new knife for my Dad who’s carried the same nail nick 2″ish knife for the past 40 years. His thumbs are arthritic, he can’t open it so easy anymore. Hands fine, thumbs bad, but one figures hands will eventually go too. He’s in Wisconsin so no laws to worry about. Needs a small EDC. Price isn’t an issue (I’m replacing a knife a man has carried for 40 years) but he isn’t gonna give a crap about steel quality. Used for random odd things, nothing specific. Ideas? That’s a tough one. Some knives are easier to open and close than other, but I’m not quite sure which would be better for someone with reduced thumb strength or dexterity. My first instinct would be to recommend a fixed-blade knife. A fixed-blade knife with a sheath might be easier to retrieve and “close” than any folding knife. But, fixed-blade knives are larger and bulkier. If going the fixed-blade route, Bradford’s Guardian 3 is a very good knife, and the 3.5 has the same blade but with a slightly larger handle. Bark River Knives has a couple of smaller fixed-blade knives as well. I also like ESEE. For a folding knife, I think that liner lock and frame lock knives are out of the question, since closing them really depends on focused thumb motions. I show the Benchmade mini Griptilian above, as it has a unique “Axis” lock that *might* be friendlier to older or stiffer hands. Opening still requires thumb motion, but the thumb hole is a little more forgiving than a thumb stud, and one can use two hands if needed. Closing the knife can be done with the pointer finger, or pointer and thumb. There’s not a lot of spring-back, and it’s the least-effort closing mechanism I’ve come across. Lock-back knives are another option, but some can require a bit of effort to close. 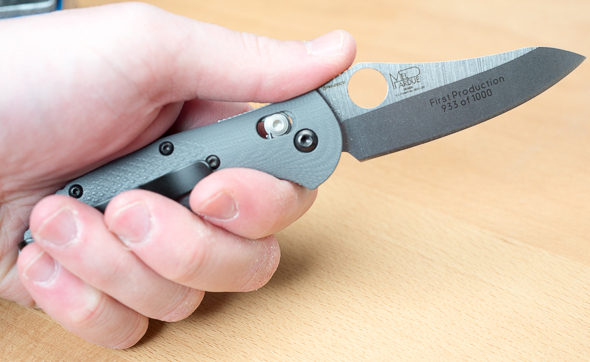 The Spyderco Para 3 has a “compression lock,” and while it’s intuitive to close, and you can use a non-thumb finger, it’s not as effortless as with the Benchmade Axis lock. Thus, my vote would be for a Benchmade mini Griptilian (they also have a larger size), at least as a first try. You can use your second hand to open the knife, if one-handed thumb opening is difficult or uncomfortable, and you can use your pointer or pointer and thumb to close the knife. If it’s difficult to release the Axis lock with the pointer finger, then the thumb can be used in a non-dominant capacity. Fixed knife? Folder? Which one(s)? An EDC knife is a very personal choice. My suggestion is to take your father to your favorite outdoor store and let him try several. He can make the selection himself. Big fan of Syperdco since they have the large thumbhole, a variety of lock options & clip options & widely available. But most of them have a back lock, which requires some thumb strength to operate. I’ve been using my Benchmade Mini Griptilian outside in finger-numbing winters for a few years now with good success. The lock mechanism is rigid and inspires confidence when open, but the knife is easy to close with cold or gloved hands. I might recommend trying out the full size Griptilian, though, since the mini can feel a tad small at times and is therefore easier to fumble. I personally prefer the thumb stud over the thumb hole for one-handed opening (flick the stud with the top/fingernail of my thumb) though that may not be the best for the questioner’s arthritic father. I guess maybe the question is more dexterity or strength as the issue. My dad is in a similar boat now that he’s 75. His is a dexterity issue not strength. So I got him a leatherman skeletool because he liked mine. turns out the thumb “hole” open and liner lock felt good to him. Which honestly surprised me but he has large hands – so pressing down with big thumb, on side and swing – works for him. Closing is sort of an issue though in that he forgets to press the inside down – and really that’s because he’s never had a liner lock before more than it’s an effort problem. I’m normally somewhat hesitant to recommend Gerber these days, but the LST that I have is very easy to operate and seems to have decent edge taking and holding. If my hands get too sore to open a knife easily, I’ll have zero issues going with a fixed blade, especially with a good horizontal sheath (like that Bradford, beautiful). Not having to dig in a pocket is appealing, too. There’s something about a full tang knife that is all-business, too. Can’t overlook that, especially if your quantity of days passed is taking a toll in other ways. I’d further have to guess that some of the ladies would take notice & approve as well. I have 2 benchmade knives and really like the axis lock. I removed the studs on mine because if you pull the lock and make a little wrist flick they open right up and to close just pull the lock and turn them upside down or brush the back of the blade on your jeans and they are closed. Best knives I have owned. I’ve heard the CRKT Foresight is pretty good for those with Arthritis. It’s not a cheap knife, price wise, but it’s supposed to be quick and easy to open. I’d post a link to CRKT’s page, but it seems doing so causes my replies to be jettisoned into the void. This is my forth attempt at writing this post lol. It’s a good knife, but liner and frame locks are solely dependent on focused thumb pressure to close. Something g like a Milwaukee fastback, with an external button (or a sliding switch) for release, might be good. Although I generally actuate mine with my thumb. Years ago I had a cheap knife with a ball bearing button as a release which made things easier, might have been a copy Of a design already mentioned. For a fixed blade, I can recommend the Morakniv Companion. Cheap and good, and super-comfortable and easy to hold, far more than any knife with slab scales. But the blade is 4 inches, which might be a little much. They do make a shorter knife, the Eldris, but the handle is shorter too. I wonder if he would like one of the Milwaukee Flip-backs. They are about as easy to open as you can imagine. You just press a button and the blade assembly swings out like a pendulum. I like the Compact, bcause you can choke up on the handle for more control. I own both of these and agree with you. The boker plus psk looks like a good candidate for a small horizontal carry fixed blade. I don’t have any experience with it myself. I have a nerve disease that is similar to arthritis in terms of limitations. I’m also an avid knife nerd. Axis lock is nearly unusable for me one-handed because my thumbs are bad. I own a Benchmade 300 I never use. On the other hand, it’s safer to close (two-handed) than a liner lock. Even with 20 years of muscle memory I severed the tip of my thumb closing my liner-lock Kershaw Link. Automatics of any kind are impossible for me to use one handed. If he can edc a prominent knife with a belt clip the Mora Companion is perfect in every way. The grip might as well have been made specifically for older hands. The sheath is wide-open at the top and requires little accuracy to drop the knife in, then clicks in snugly with a little thump on the hilt. It’s under $20. They come in non-threatening colors like baby blue which serves to reduce the appearance of carrying a weapon. I do not carry for defense but if I had to use any of my knives defensively I’d want it to be the Mora because it requires only gross motor skills to draw and grip. BUT LET HIM CHOOSE THE KNIFE. Take him to the biggest knife/gun/tactical supply shop in your area. A shop which is veteran-owned will almost certainly be very interested in working with him to find his perfect knife to match his capabilities and needs. I tried both fixed and several flippers finally settling on a Kershaw auto opener. Great knife with drop point blade and very reliable. Keep her oiled and she’ll never let you down. Why not get an automatic? I have a Lightning otf that has been nothing but reliable and stays pretty sharp for how cheap they are. Or for a button style the boker kalashnikov and the kersaw automatics come we’ll reviewed. I too am an older man with severe arthritis. Get a double action OTF knife. Aha. Morakniv makes a “carving” knife with a 3″ fixed stainless blade. Comes with a sheath. Being Mora, it will likely provide outstanding performance and value. steel handguard, with a carbon steel blade. 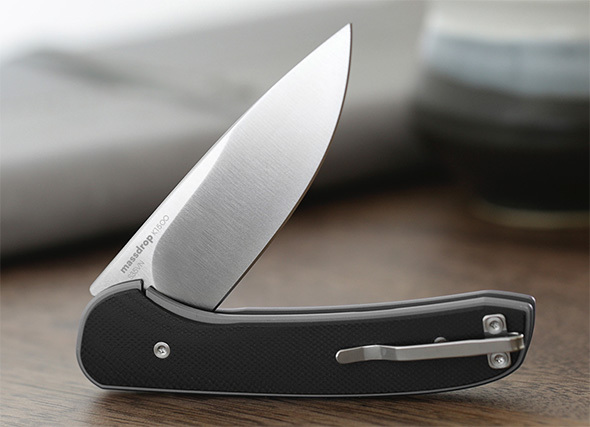 An adult reviewer says the handle is a bit small, but it makes the knife more compact. If he likes the idea of a fixed blade, I’d suggest you buy both and return the one that doesn’t work for your dad. They also make other woodcarving knives with even shorter blades, but the handles are simple barrels, with no finger guards or even a way to feel which way the blade is oriented. A review said it can be easy to cut your thumb on the edge if you don’t pay close attention. The guy suggested carving some texture or finger grooves into the handle. Smallest fixed blade knife, but with a good handle is the Mora Eldris. The blade is a little over 2″, but if only been using 2″ folder for 40 years, I guess it’s suitable. I have mild arthritis so far and I use a Ontario rat 2. I have no issues opening it. I keep it well oiled to make it even easier. since he is use to a slip joint knife, an opinel might be an option. Spyderco urban is a slip joint knife with a nice sized spydy hoke that’s easy to grab with thumb and forefinger without really using the thumb joint. I wouldn’t suggest any type of locking knife. 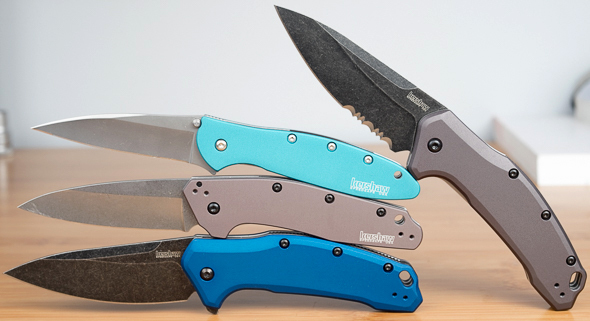 While they are anything but cheap, I highly recommend Emerson knives, specifically the ones that have the “wave” feature. Its a little shark fin shaped piece of metal near the base of the spine of the blade that is used to open the blade when removing it from your pocket (if you want to open the blade. not mandatory). It doesn’t require any complicated actions, the blade if needed will deploy faster than any switch or spring loaded blade, and best of all…. you can legally carry one even where I live in the People’s Republic of Kalifornia. It’s also in my opinion very safe since you don’t have your fingers near the cutting edge during deployment where if not fully clicked into place, could close on your hand. Milwaukee Fastback or Morakniv Companion (or similar). So I’m the Paul referenced in the question above. I’d like to thank Stuart for featuring my question and everyone for their responses. I’d have responded earlier but I didn’t really have anything to say other than thanks for the responses because I never really made up my mind. I ended up getting him three knives and letting him pick and have my Mom return the rest. Sort of an in home Christmas morning audition. I’ll share what I learned for anyone looking up the subject who stumbles upon this later – if you know things about knives, some of this will seem pretty obvious. The three I went with were the Spyderco Delica, Spyderco Tenacious, and the Benchmade Mini Griptillian. He liked the Griptillian the best and kept that one. Will explain, coming up. One suggestion was for a fixed blade knife. Knowing my Dad, walking around with a fixed blade on his belt wasn’t an option anywhere outside his backyard. So there’s my first choice. When I started researching, being a knife idiot, I assumed the opening part was challenge. Not really it turned out. Most decent and even cheapo modern knives are pretty easy to open with a thumb stud or hole. Assisted open and automatic knives are really a personal preference; not necessary for people with hand issues. Automatic, assisted opening, or any knife that deployed by just pulling it out of the pocket weren’t going to be options for my Dad. Not sure how to explain this one, but he just likes to be in control of “things”. He’s not a control freak or anything, just…well maybe he’s like you guys that like manual screwdrivers. Anyway, knowing him, I could discard these ideas. People debate brands endlessly on smooth opening, Spyderco was mentioned frequently for it’s “smoothness”…but then, it’s also a super popular brand so bound to get mentioned a lot regardless. Some knives have bearings on the hinge, some people love, some people think maintenance problem waiting to happen. Yeah, that, if you research knives you’ll find no consensus on anything. Everyone’s got an opinion, they don’t all match for the most part. However, one thing I did find was that most people with bad hands did prefer thumb holes over thumb studs. No one had a reason, but it helped me narrow down somewhat. Third choice made, need a thumb hole. All the above is really pointless because what I really learned was that the most difficult part of operating folding knives is the lock. You’ll see in the suggestions above that most of them address releasing the lock. When I started this I didn’t know anything about them. Ideally, I thought, I’d find something like my Milwaukee Fastback Utility Knife. It’s got a button to release the blade to flip open, and the same button to release the lock to flip closed. It’s designed for right handed people, but I’m left handed, and I can open and close it one handed with my left hand using only my fingers, my thumb waggling in the air. The lock is really loose though, lots of blade play. Fine for a utility knife but apparently not used for regular blades. The Fastback blade is a liner lock. So locks. Most require thumbs in some way. Frame and Liner locks seemed the most common. Frame locks being more sturdy, but requiring more force to release. So, liner lock over frame lock. Choice 4. The Spyderco Tenacious has a really large, comparatively to others, area to press on the release the liner lock. That might work. Also, pretty cheap and I could get nicer G10 handle (scales). But it seems really big. Anyway. That was choice one. A lockback knife can be released with the index finger, but does require thumb strength to hold the knife while doing it. But, really, maybe that’s if you’re trying to do it with one hand, sure. I figured Dad didn’t care about one handed operation. With two hands this will work and also I just thought the Spyderco Delica was pretty sweet knife, I never cared about knives before, but found myself wanting one. That was choice two. I had originally dropped the Griptillian and Mini Griptillian from my choices because the first images and options that come up on Amazon had thumb studs. And as I started my search thinking about opening rather than lock releasing I had discounted the thumb stud and so this knife. But as I learned here, there’s also a thumb hole option. And, testing one, if you have bad thumbs, using the grip technique in Stuart’s video most of the force to release the Axis lock can come from your index finger, with the thumb for just bracing. So that was the third choice. I live 2000 miles away from my Dad, so taking him to the store wasn’t an option and I also wasn’t able to be there Christmas morning as he explored these knives. He liked both the Delica and Mini Griptillian. They were very intuitive. He couldn’t figure out how to close the Tenacious. My sister was also there, and her husband, British and also apparently not a knife guy, Googled how to close and my family, w/o me, learned how to close a liner lock. Also he thought it was too big. Which I knew it was, but I’d sorta asked him earlier, obliquely, about knives and sizes and he’s like a 4 inch blade is perfect and I’m thinking maybe Dad isn’t so good with what an inch is. Turns out I was right. There are some things I learned about my Dad and knives since asking Stuart my question that informed my choices that you probably don’t care about so I won’t share. But the one that I will share, and something of a reality check for me on the drama of researching this knife, was that my Dad didn’t care anything about his folding pocket knife. I saw him using this knife, it’s an early memory, when I was 5 or 6 or something. And then, the genesis of this idea, I saw him fumbling with the same knife and complaining about his arthritic thumbs a few months ago. But it turns out, in the 40 years in between, I wasn’t paying attention. He’d carried a dozen other knives, all similar Buck/Swiss Army-ish nail nicks in between. Just so happened, most of those had failed, and on the day we were working together last fall, he grabbed the one I remembered from childhood. So, giving him a new knife didn’t have any drama. He was just like, awesome, this is way better. Way easier. Didn’t have to separate him from anything he cared about. Anyway, if you gift, know you’re recipient. Thanks again Stuart. This was all very helpful.